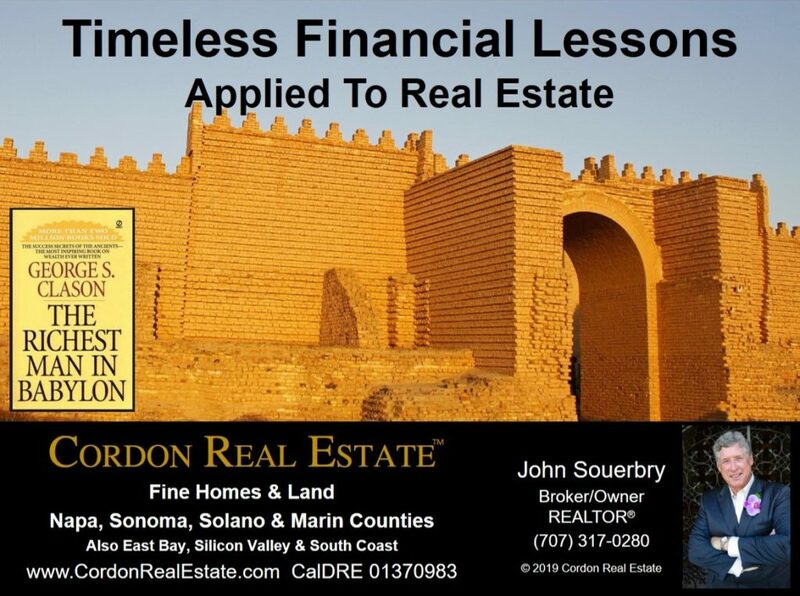 Timeless financial lessons for individuals and families often relate to preparing a household budget, investing for retirement and analyzing the effects of interest rates when buying a home. But The Richest Man In Babylon by George S. Clason, on more college business major reading lists than virtually any other book, contains none of that. Yet it is at the top of my recommended reading list for home buyers and budding real estate investors. There is one particular principle explained in the book that is important to buying and selling property – we’ll discuss that one in a minute. The Richest Man In Babylon is a collection of parables originally written and printed by Clason as pamphlets, the best of which were assembled into a book and published in 1926. Stories provide insights on how to grow wealth through hard work, invest wisely and safeguard your assets. The tales are set in ancient Babylon, though the action could just as easily take place in modern-day San Francisco. I hope you will pick up a copy (see link below to order on Amazon.com). One of Clason’s simple parables that I believe relates most directly to real estate sales describes a man who wished to purchase gem stones. Upon learning that a friend will soon travel to a city known for selling quality stones, the man asks his friend to buy gems on his behalf and provides him with money to make the purchase. The friend knows nothing about gems, but agrees. The friend is fooled by the gem merchants and returns home with fake, worthless pieces of colored glass. The lesson of the parable is that when conducting business, work with professionals who know the product and how to buy and sell profitably. This lesson obviously applies to real estate in many ways. Sellers who attempt to market and negotiate sales contracts without prior experience or training (For Sale By Owner) are one example, buyers with similar qualifications who try to negotiate their own purchase contract are another. There are other mistakes frequently made during real estate transactions that may not be as obvious, so I’ll point out a few of them. Mortgage advice from real estate agents. Unless they are also licensed mortgage professionals, real estate agents should not provide specific advice to clients on the details of mortgage products. They might suggest general options, but when specific advice is needed, buyers should consult with mortgage professionals who specialize in financing the type of property in question. Program features and qualifying requirements can change rapidly, so seek financing advice from a qualified specialist. Financial planning advice from real estate agents and mortgage lenders. Unless they are also a Certified Financial Planner (CFP) or other qualified financial consulting specialist, agents and lenders should not advise clients on preparation of household budgets, savings programs and other personal financial planning issues. Many home buyers set their purchase price limit based on the amount their lender says they are qualified to borrow. Buyers are far better off spending no more than what they can afford based on a comprehensive, long term budget that takes into account all current and future expenditures, as advised by a qualified financial planning professional. Skimping on inspections. General home inspectors are usually the first person to tell buyers and sellers when a specialist is needed to look at a specific problem or feature of a property. Inspection specialists might include well inspectors, septic system inspectors, soils engineers, surveyors and electricians knowledgeable in current building codes. Don’t skimp on hiring qualified inspectors as needed. Unlicensed contractors. There are lots of cut-rate handymen who will offer to make a repair or replace a fixture cheap. Many do fine work, but many also don’t. Further, if they are not licensed they are probably also not insured and their work is not guaranteed. Working with licensed, qualified contractors usually guarantees quality and reduces risk. By now, I think you get the message regarding the need to work with qualified professionals in all areas of home buying, selling and everything that goes along with it. These are timeless financial lessons that I hope you will read in detail in The Richest Man In Babylon. If not already in your library, pick up a copy by clicking the Amazon.com link below. To dig in deeper, order the version that comes with a comprehensive study guide.